When classic yachts from the Feadship Heritage Fleet gathered in Monaco, it was a great opportunity for owners to do what owners do best: sit on the aft deck with their friends and share their passion for their boats. 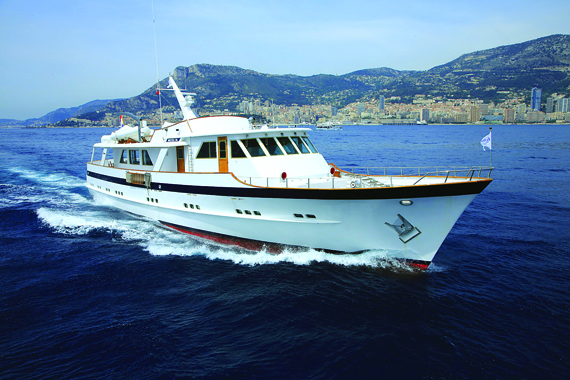 The Feadship Heritage Fleet is an owner’s club like no other. Formed in 2013 with the full support of the yard as an association of owners of Feadships of more than 30 years old, it provides a forum for owners to exchange information about conservation and restoration – and, of course, to have a rollicking good time with like-minded folk. This is why six classic Feadships, launched between 1964 and 1972, gathered in Monaco for this year’s Grand Prix Historique. Rembert was collecting original design drawings one day at the Feadship De Voogt offices while wondering how best to return the yacht to her prime condition, when he was asked if he’d yet talked to the Feadship yard in Aalsmeer. “It had never crossed my mind as I thought they would be too busy doing megayachts for important clients all over the world, and that I would never be able to afford it anyway!” he says. But they were interested and he could afford it, and a restored Serena emerged in 2011 after 43,000 hours of hard, skilled work. “Needless to say, I have been a very proud owner for the past few years, cruising all over from Scandinavia and Scotland, to Cuba, the East Coast of America, and back to the Mediterranean,” Rembert continues. “Everywhere we go, heads turn and reactions are so positive. It has been a big pleasure being a part of this process. Bringing back Serena in perfect shape and keeping her there has been very satisfying,” he says. 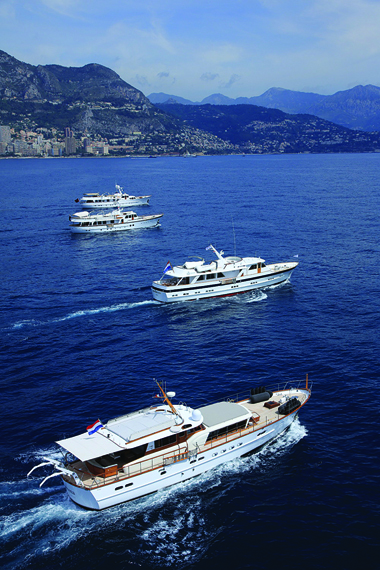 The Feadship Heritage Fleet Committee decided it would be a great idea to gather a small group of boats stern-to at Monaco. “Being a member of the Heritage Fleet keeps the Feadship spirit alive: you are enjoying and maintaining a piece of history,” says Theo Hooning, secretary general of the Feadship Heritage Fleet. 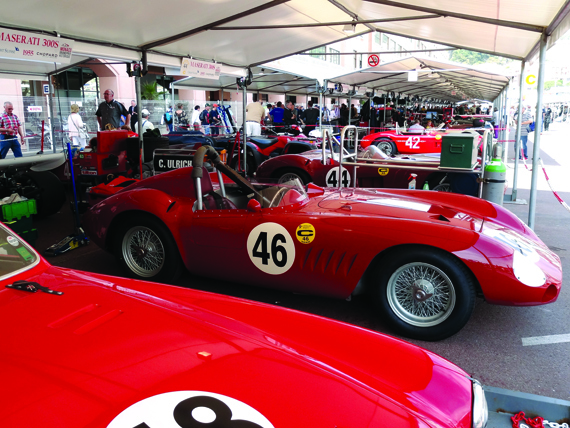 The Principality was geared up for the ninth Grand Prix Historique – an event organised by the Automobile Club de Monaco around the famous 3.34km circuit as a dry run for the F1 race a fortnight later. Things are more relaxed for this event than when the F1 circus is in town, and day one at the Heritage gathering was kick-started with a healthy breakfast – or, for the traditionalists, bacon, eggs and toast with real butter. The eating was punctuated with talk of a late arrival to the gathering. Sultana – impressively restored between 2008 and 2012 – which was on her way from San Remo with one mission in mind: to join the five boats already moored stern-to by the Tabac bend. Launched in 1969 under her original name of Din-Dina III, Sultana has crossed many oceans and experienced many owners, but was rather down on her luck when, in 2007, an enthusiastic Dutch yacht expert found a neglected hull, rusting and destined for a life of decay in the shipyard at Beaulieu-sur-Mer. Once Serena arrived in Monaco to join her sisters, we could see that the rebuild incorporated everything that would be required by today’s most discerning of clients. The meticulous attention to detail has been delivered beautifully, while the classic feel and atmosphere are lovingly maintained and supported by the latest technology. The boat is economical and green, too – consuming 30% less fuel than conventional yachts of her size. The strengthened glass panel in the floor of the main salon is a staggering feature – you can see the totally rebuilt Gardner engines below. One other notable feature on a long list of notable features was the chimney housing a retractable gas barbecue, two fridges and an ice-maker. Everyone had been talking boats and refits, and we’d momentarily forgotten about the cars. The silence was soon to be broken by the deafening noise of a Série A car (representing pre-1939 builds), a 1929 Bugatti 35B. This historic GP started in 1997 to commemorate the 700th anniversary of the Grimaldi dynasty. 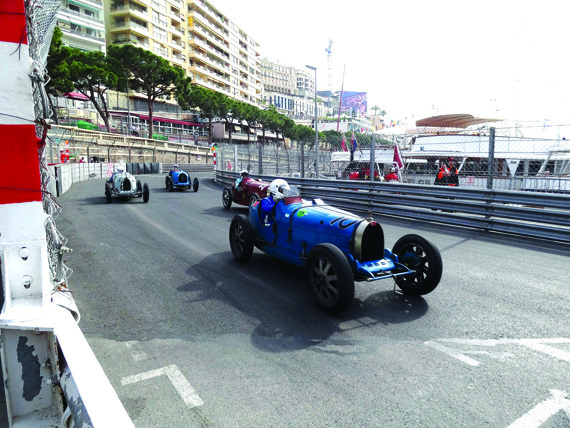 The Automobile Club de Monaco decided it was a good idea to feature cars that had taken part in the Monaco GP since it was first run in 1929. More than 200 cars were represented at that first event. It was planned as a one-off, but its huge success gave birth to another race in 2000, and it has been repeated every two years since. This 2014 edition yet again brought enthusiasts from all over the globe. Famous names of yesteryear hurtle past – Riley, Maserati and, of course, a host of Bugattis. The Séries that follow showcase a host of familiar names – BRM, Lotus, Ferrari, Aston Martin, Jaguar, Lola, BRM and Brabham. We were all extremely happy to see these wonderfully cherished and thoughtfully engineered speed machines that reflected the same care and concern from their owners as shown by Feadship Heritage Fleet owners. With the day’s racing done it was Heineken o’clock on board Mr Heineken’s appropriately named Something Cool, a 30-metre from 1964. Then came the fleet-hop: owners, captains and crew were very welcoming and proud to show us their Heritage Fleet boats: the 1972 32-metre Heavenly Daze; the 1964 23-metre Serena; Beija Flor at 35 metres (1967); Najade at 28 metres (1964); and, of course, Something Cool and Sultana. “Nobody buys a classic Feadship by accident,” says Victor Muller, the owner of the Feadship The Highlander, as well as the driving force behind Spyker Cars and a guest at the event. “Generally, they are successful in business, they have an interesting and positive view on the world, and they love their Feadships for the same reasons – beautiful design, fantastic craftsmanship, extraordinary build quality,” he says. The added point of interest now is the support of the Feadship organisation for the Feadship Heritage Fleet. “There are parallels with what is happening at Ferrari, who started Ferrari Classiche some years ago. This is a department in the factory where your classic car can be audited, and as an owner you will be given a report stating which parts are not original and need replacing. After the work is completed, you will have a certificate of originality. The certificate now adds 20-30% value to your treasured Ferrari. This is what will happen to your classic Feadship – the boat will be certified as an original Feadship product,” he adds. “Part of the pleasure of owning a Feadship is knowing that you are participating in a heritage of craftsmanship, technology and design unique in the world of motor yachts,” adds Rory Brooks, the owner of Heavenly Daze and vice-chairman of the Feadship Heritage Fleet. We were joined by a current racing driver from the US who had just purchased a Feadship classic from the 1960s. He was absolutely convinced that Feadship should restore his recent acquisition. Pencils were drawn and sketches followed: nothing gets the juices flowing like the thought of a restoration to come.